Claire has been working as a physiotherapist for over twenty years, and has been with the clinic for twelve years. Having graduated from Coventry University in 1992, Claire worked In London for three years, before moving to Boston, USA for two years. Whilst there, Claire ran the musculoskeletal physiotherapy department at New England Medical Centre in the centre of Boston. When she returned to England, Claire then studied with the Australian Pilates and Physiotherapy Institute, achieved her Matwork 1 & 2 Pilates qualifications, and became a Pilates class instructor. She is also qualified in antenatal/postnatal Pilates instruction. 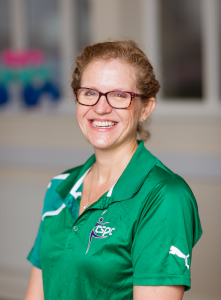 Claire combines her physiotherapy and Pilates skills in her work, and is very experienced at prescribing stability and mobility exercises tailored for your injury. Since working in the clinic, Claire has taken a number of courses including; muscle energy techniques for the lumbar spine and pelvis, thoracic spine and ribs. She has done a course with Stuart Mcgill on ‘Building the Ultimate Back’. She has also attended all courses run by the clinic over the last ten years on movement patterning skills, complex injuries, chronic pain, breathing patterns, myofascial release and strain counterstrain. .
Outside the clinic Claire is a keen runner and has completed in the Great North Run, Leeds half marathon and many other local races even the Chevin Chase which helps her to understand the training and competition needs of the athlete. Claire also enjoys skiing with her family and walking on the moor with her dog. She has also been teaching regular Pilates classes in Ilkley for the last 12 years. One of Claire’s many other talents is that of cake baker extraordinaire, making novelty cakes and yummy treats, which are always a delight to our ever hungry physio team.